Iowa Barnstormers Sign DL Keith Jones, Jr.
DES MOINES – The Iowa Barnstormers have re-signed defensive lineman Keith Jones, Jr. to the 2018 roster, Head Coach Dixie Wooten announced today. Jones, Jr. (6-1, 310, UT-Martin) returns to the Iowa Barnstormers for his second season with the team. 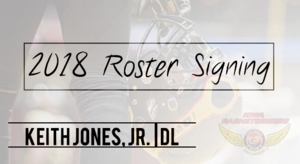 Jones, Jr. joined the Barnstormers as a rookie mid-season in 2017 where he appeared in 7 games collecting eight total tackles and two sacks. Collegiately, Jones, Jr. played 4 years at the University of Tennessee Martin. In his senior season, Jones, Jr. collected 33 tackles, 10.5 tackles for loss, and four sacks, earning honors as All-OVC Defensive Lineman.